The recommended therapy for moderate and severe Obstructive Sleep Apnoea (OSA) is continuous positive airway pressure (CPAP). This is delivered by a medical air pump into a nasal or facial mask worn by the patient while sleeping. 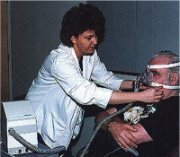 CPAP dilates and supports the upper airway, preventing its collapse, thus restoring normal breathing and uninterrupted sleep. For many patients this therapy dramatically improves daytime function and general health. CPAP therapy requires some acclimatisation. Most patients adapt well to the therapy, and those who do often experience a vast improvement in quality of life. The CPAP clinics are held on Tuesday, Wednesday and Friday. Appointments are by prior arrangement. Appointments can be arranged by contacting the Sleep Clinic reception on 9346 2422.